To go by its election manifesto the TNA seems completely unmindful of the massive effort that had to be made for the Provincial Council system to be set up in 1987-88, for the 13th amendment to be preserved in 2013 and the PC election in the North to be held under the existing amendment. In short it appears to be unconcerned about the fragility of the political space that has been prised open and the need to carry a sizeable segment of Southern opinion with it at all times or at least neutralise Southern opposition to the Council. The inflated, emotive electoral rhetoric of 1977 played its part in setting the TULF on a confrontation course with Colombo. It is about to happen again and this time the collision is more certain and will perhaps prove more consequential. One miscalculation could lead to protracted deadlock and worse still, a strategic politico-military lockdown. The TNA’s electoral manifesto shows that the Tamil politicians and perhaps their Northern constituency have learned as little as have their Southern counterparts. Here I do not refer to the call for federalism or the North-East merger, which may be objectionable to many and inadvisable to boot, but can hardly be described as illegitimate. Even if debatable, these are valid political stances and propositions. I refer instead to other important aspects of the TNA’s manifesto. One is the explicit, uncritical and deceitful references to the LTTE. It is striking that even the Soulbury Constitution is rejected by the TNA in its recounting of its mandate. That Constitution was silent on the nature of the unitary character of the state and it is the closest to a secular constitution as we have had. The explicit commitment to a unitary state and the entrenchment of majoritarianism in the form of the privileged place accorded to Sinhala and Buddhism were features of the first Republican Constitution of 1972. That Tamil nationalism opposed the 1972 Constitution is entirely legitimate. What is shocking is the TNA’s characterisation of the Soulbury Constitution. This reveals that the TNA stands opposed to any type of unitary state, even one that was designed by a progressive post-war British Labour administration, is discreetly silent on that unitary character and did not entrench majoritarian hegemony as did the successor Constitution of 1972. The conclusion is thus inescapable that the majoritarianism that the TNA is opposed to is simply, democracy itself. To put it politely this is nothing less than a lie. What does the TNA call the Indo-Lanka accord and the North-East Provincial Council? What of the Interim Administration of September 1987 which granted the LTTE 7 out of 11 seats including the chairpersonship? The Tigers resumed their armed struggle despite the existence of alternatives such as these, and proceeded to assassinate Rajiv Gandhi. What also of the dialogue between President Premadasa and the LTTE? The Tigers unilaterally resumed the war while the talks were ongoing. What of the Manalaga Moonesinghe proposals of 1993? Premadasa was assassinated despite these political efforts. What of Chandrika Bandaranaike Kumaratunga’s advanced political reform packages of 1995, 1997 and 2000? Did the Tigers stop their war or did they continue despite the availability of reformist political options? The TNA manifesto then says that “Though initially there were several military outfits, since 1987 the LTTE emerged as the sole military force in pursuing the struggle.” How pray did the LTTE ‘emerge’ as the sole military force? Did that emergence have anything to do with the murder of Sri Sabaratnam of TELO and the burning alive of TELO cadre in the streets of Jaffna while shopkeeper served soft drinks, on April 30th 1986 by the LTTE? Was the miraculous emergence linked in any way to the massacre of EPRLF captives who had been rounded up in late 1986, also by the LTTE? Was it in any way connected to the burning alive on the beach of Vasudevan the political leader of PLOT in the Eastern province, by the LTTE? The TNA manifesto then laments the fact that the “Ceasefire Agreement…did not last and hostilities broke out between the government forces and the LTTE with the military confrontation coming to an end on 19th May 2009.” This mealy-mouthed statement omits to mention that during that CFA the Tigers murdered dozens of police and armed forces personnel and demonstrated its striking commitment to the CFA by shooting the Foreign Minister of Sri Lanka, Hon Lakshman Kadirgamar. The TNA manifesto should either have avoided any reference to the LTTE or if reference had to be made it should have included a denunciation of internal executions, lethal attacks on unarmed civilians , the murder of Tamil intellectuals such as Rajini Tiranagama, the savage slaughter of the EPRLF central committee, the assignation of Rajiv Gandhi (thanks to whom the TNA has a Provincial Council to contest, enter and complain about) and the liquidation of many Tamil political leaders such as Appapillai Amirthalingam, and Neelan Tiruchelvam. The failure to do any of this and the references to the LTTE entirely without disapproval show that the TNA is either susceptible to the pro-Tiger sentiment of sections of the Tamil Diaspora and Tamil Nadu or to such sentiments within its own ranks or support base. It also shows that the TNA is dangerously interested in profiling the LTTE as part of the narrative of the Tamil struggle rather than a deviation/aberration. The TNA also seems ready to place itself on a political continuum with the LTTE’s ‘struggle’. Finally, it shows a complete lack of sensitivity to the sentiments of the vast majority of the country’s citizenry, not to mention the armed forces. The TNA manifesto says that “An Independent International Investigation must be conducted into the allegations of violations of international human rights and humanitarian laws made against both the Government of Sri Lanka and the LTTE during the last stages of the war”. It should try to figure why the Sinn Fein/IRA, having entered mainstream electoral politics, never called for an international inquiry into Bloody Sunday, and mass internment that led to the deaths of Bobby Sands and others etc. The TNA has raised a slogan which will have absolutely no resonance whatsoever in the South. The TNA identifies its political solution as one of shared sovereignty among the peoples of this island. The TNA must grasp that in Sri Lanka which is a democratic republic, power may be devolved from centre to periphery but sovereignty is not ‘shared’ by constituent peoples. Sovereignty is vested in the citizenry as a whole. The manifesto states that “the TNA firmly believes that sovereignty lies with the People and not with the State. It is not the government in Colombo that holds the right to govern the Tamil People, but the People themselves.” This is a strange sleight of hand. The term ‘people’ in the first sentence slides into ‘Tamil people’ in the second one. Sovereignty does indeed lie with the people but that does not mean it lies with the people of one ethnicity; it means the people taken as a totality; the people as a whole. This denotes a criticism by the TNA not of the current regime or post-war policy but of the 13th amendment as promulgated in 1987 itself. The TNA evidently regards the Sri Lankan state even of 1987 as an authoritarian state (though Madam Pillay considers that it is moving in an authoritarian direction) and regards itself as posing nothing less than a fundamental challenge albeit a democratic one, to that state. Thus the problem is not with a policy or a policy regime but with the state and with the structural reform that is the 13th amendment. The TNA must know that there is only one way to overcome the shortcomings that it laments. That is by means of a referendum that must necessarily be island-wide. This in turn either requires the TNA to convince the majority of voters while going against the views of the existing government or to support a party that will form another government which would support the TNA in its bid. I can only wish it luck. The concluding sentence of the TNA’s manifesto says that “The TNA is firmly of the view that justice to all Peoples who inhabit Sri Lanka and genuine reconciliation through permanent peace is only achievable under international auspices.” This is a clear signal that the TNA does not consider as its primary partner, democratic opinion and the democratic forces of reform in the rest of the island. Furthermore it means that any alliance with the TNA, as a party that is firmly of the view that justice, reconciliation and permanent peace are “only achievable under international auspices” would amount to an electoral kiss of death for any Southern mainstream democratic candidate or formation. The TNA has made a choice. So be it. This does not mean that the TNA should be coerced or legally harassed in any way. Still less does it mean that the Provincial Council election should not be held. What it does mean is that the TNA cannot and should not be trusted politically, not only by the Government of the day but the Sri Lankan state and the democratic polity. 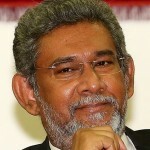 The policy towards the TNA should not be one of roll-back or cut back of devolution as urged by the Sinhala hawks, but must certainly be one of vigilant containment within the strict boundaries of the 13th amendment, until that political bloc – and Tamil political opinion–evolves in a more moderate and realistic direction, however long that takes.